It’s rare when a comedy sequel works on all levels. With sequels, you’d hope the original cast comes back and there is a good balance of returning and new jokes and plot devices to make it stand on its own without doing the same recycled material as the original. 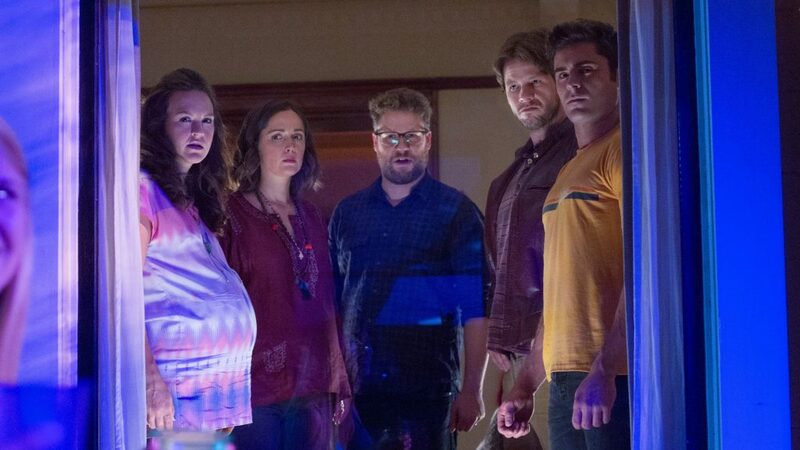 With the case of ‘Neighbors‘, you had a pretty great cast with Seth Rogen, Rose Byrne, Zac Efron, Dave Franco, and Christopher Mintz-Plasse, in an ‘R’ rated comedy about a couple with a newborn baby, trying to raise a family next to a frat house. It was a solid premise with a lot of funny moments. The small budget film of only $18 million went on to make over $270 million at the box office. So it comes as no surprise that two years later, there is a sequel with the same cast and crew returning. Only this time, instead of a frat house, it’s a sorority that takes over and goes to war with our funny parental couple. Fortunately, the original writing, producing, and directing team came back, along with the cast (along with a few new cameos), that made this comedy sequel bearable. I wouldn’t say that ‘Neighbors 2‘ is anything special, or even uproariously funny, but it gets the job done, just like the first one did, despite some issues. A little time has passed since Mac and Kelly Radner (Seth Rogen and Rose Byrne respectively) got rid of the frat house next door to them. Their daughter is a toddler now who takes a keen liking to a toy and a second baby is on the way. On the other side of things, Teddy Sanders (Zac Efron) and is group of frat brothers all seem to have outgrown the frat life and mentality and have all become successful members of society, with the exception of Teddy, who can’t seem to move past his college years. Mac and Kelly have just sold their house and are in escrow for 30 days, so things must go smoothly with inspections for Mac and Kelly to move out. That’s when incoming freshman Shelby (Chloe Grace Moretz), Beth (Kiersey Clemons), and Nora (Jonah Hill’s little sister Beanie Feldstein), decide to rent the house next to Mac and Kelly to form their own Sorority, since the ones on campus are not allowed to party, do drugs, or drink. This sets off the same battle between Mac and Kelly and yet another greek house, full of vicious pranks. Teddy fits into this scheme on both sides, as he just wants to be valued and appreciated. There are some moments of some very funny dialogue and some gross out humor that should cause some laughter, but more or less, the film just kind of drags along with montages of party sequences. The big fatal flaw of the film is the sorority themselves. These girls are wholly unlikable. What they do, say, and think is unbelievably asinine. It was a super unrealistic portrayal on any college freshman and really not even that funny. These girls were being mean just to be mean, and that’s no way to set up characters you at some point want to root for. In fact, the only good moments were when Seth Rogen was on screen by himself or with Zac Efron. Those were when the funniest moments happened, as the two have great chemistry. Don’t get me wrong, I love Chloe Grace Moretz, but here, she just doesn’t seem to fit in or play someone relatable at all. All of this being said, there are moments of some solid jokes, but they are few and far between. I’m sure this will do well at the box office again, but let’s hope this is the last one of these ‘Neighbors‘ movies. This entry was posted on Wednesday, May 18th, 2016 at 12:20 pm	and is filed under Film, News. You can follow any responses to this entry through the RSS 2.0 feed. You can skip to the end and leave a response. Pinging is currently not allowed. « Get on the Stick with ‘Mr. Robot’!